REPORT ON ANNUAL GENERAL MEETING OF CCSAGE NATURALLY GREEN, 2016. The Annual General Meeting of CCSAGE Naturally Green was held on Sunday, March 13th, 2016, at the Waring House, Picton. That same morning, Wind Concerns Ontario held its own AGM in Wellington and its members later joined us. Our meeting was deliberately open to the public, and altogether some 110 people were present, including our own members, the County Mayor and several Councillors and the editors of the two most important local papers. Each featured lengthy and accurate reports in their next editions which may be accessed at http://wellingtontimes.ca/gathering-forces/ and https://issuu.com/pictongazette/docs/pictongazettemar17 respectively. Following introductions by our two directors, our accountant, Mustafa Alidina, who donates his services, presented our financial statements for 2015, disclosing an excess of revenue over expenses of $8,572.00. It supports and believes in green energy which is both safe and appropriate, and encourages small scale solutions and conservation measures. CCSAGE welcomes the findings of two Ontario Auditors-General as expressed in their separate Reports up to including that of 2015. Translated into everyday language they find the Green Energy Act to be an economic disaster, enacted without benefit of technical advice and with no consideration of a business rationale or of its overall impact. CCSAGE agrees with the published opinions of several well-known economists and energy expert to the same effect, including Michael Trebilcock, Keith Stelling, Dr. Glenn Fox, Ross McKintrick and Tom Adams. CCSAGE agrees with the published opinion of the Energy Task Force of the Ontario Society of Professional Engineers (April 2015), which shows that increased use of wind and solar energy on the Ontario grid is causing a dramatic increase in both carbon emissions and electricity prices. Consistent with the Environment Canada recommendations noted in Environment Canada document, Wind Turbines and Birds, A Guidance Document, including consideration of cumulative effects, requirement for baseline surveys, and consistent with the 11 listed criteria where they not be sited, such as Important Bird Areas and migration corridors. Never where adverse health effects to humans are possible. Never where local economies could be adversely affected. Never where the natural environment could be unreasonably disturbed. Should any Municipality indicate that it is an unwilling host to such an installation, the wishes of that Municipality would prevail over the current provisions of the Green Energy Act. Energy projects would not be excluded from the Environmental Protection Act. Any appeal of permission granted for an installation would be to the Courts utilizing evidence presently permitted by the Courts. The Environmental Review Tribunal would be abolished, as its terms are inconsistent with protection of the environment as well as the Statement of Values of MOECC and MNRF. Any such permission must restrict payment to the proponent to a maximum of the then weighted average price of electricity produced in Ontario by nuclear, hydro-electric and natural gas sources. CCSAGE has filed an Application to the Supreme Court of Ontario for Judicial Review of the circumstances and background leading to the issue of a Renewal Energy Approval for 27 turbines in the south part of the County of Prince Edward. This does not detract from, but underlines, CCSAGE’s wish to be constructive rather than negative, as it concentrates on the deficiencies of the Green Energy Act, on its bias against rural communities and on the infringement of citizens’ rights and of statutes and international treaties. A good friend of mine runs a business in the County. He has done so for 40 years. He showed me his electricity bill last week. In December, he spent $770 on electricity. It was one of the least expensive lines on his bill. The global adjustment charge was $4,267.32. There was also a delivery charge, a debt retirement charge and an array of taxes. In total, he spent nearly $10,000 in December—for $770 of electricity. He doesn’t know where this money is going. He is not sure he can keep up. He isn’t alone. 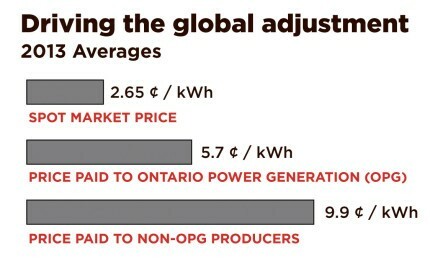 The global adjustment is a catch-all fee that covers the provincial government’s intervention in electricity generating market. It pays for solar generators, industrial wind turbine plants and subsidized exports to Michigan and Quebec. It covers the subsidized rates some chosen industries pay. It pays for the lawyers who battle residents and groups—including the Prince Edward County Field Naturalists—at tribunals and courtrooms across the province. In essence, my friend is paying an amount nearly six times the value of the electricity he used to line the pockets of industrial wind developers, solar companies, lawyers, foreign owned smelters, as well as enriching Michigan’s coffers to take this power off our grid. He has enough challenges in his business—he can’t afford to pay the cost of the Ontario’s Liberals decade of mismanagement of electricity in this province. Your June 12th op-ed piece (Wind energy emerging as electricity option with best ratepayer value) by Robert Hornung for the County Sustainability Group (CSG) is what one should expect from Hornung’s employer, the Canadian Wind Energy Association (CanWEA). In his article, Hornung cites a flawed “independent” study prepared for CanWEA by Power Advisory of Boston, that was authored primarily by a former executive from the Ontario Power Authority (OPA) who had responsibility for negotiating lucrative 20 year contracts for CanWEA corporate members. This comparison clearly shows that wind energy is not the “best ratepayer value”. But wait. There are many other costs not acknowledged by CanWEA. 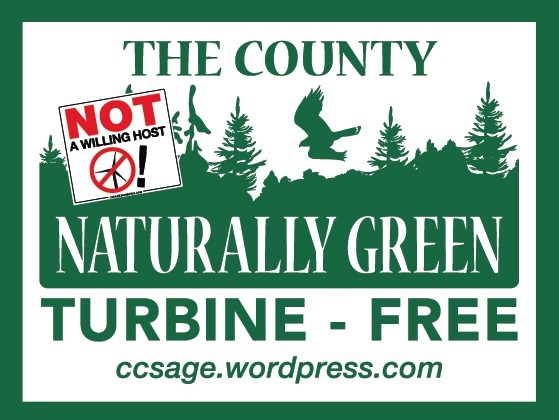 At the beginning of May, CCSAGE NATURALLY GREEN took ads in local County papers and on CountyLive to point out existing legal rights to claim compensation if the construction of industrial wind turbine factories cause adverse effects to the value of businesses and properties. Within three weeks, almost 400 County business and property owners indicated they would consider bringing such claims. What did we do with this overwhelming response? On June 4th, we wrote to the Premier, the Ministers of Energy and the Environment, the leaders of the two opposition parties and the Presidents of Gilead Power and wpd Canada Corporation. Below is a copy of our letter for your information. You can read a copy of our letter HERE . We notified our colleagues in all parts of Ontario with or threatened by industrial wind turbines of our initiative and its result. We issued a media release to every print and electronic outlet in the entire Province. We’ll keep you informed from time to time of future developments. Meanwhile, thank you to all respondents on-line, by mail, at our Town Hall meeting in Milford and in response to canvasses on Picton, Bloomfield and Wellington Main Streets. 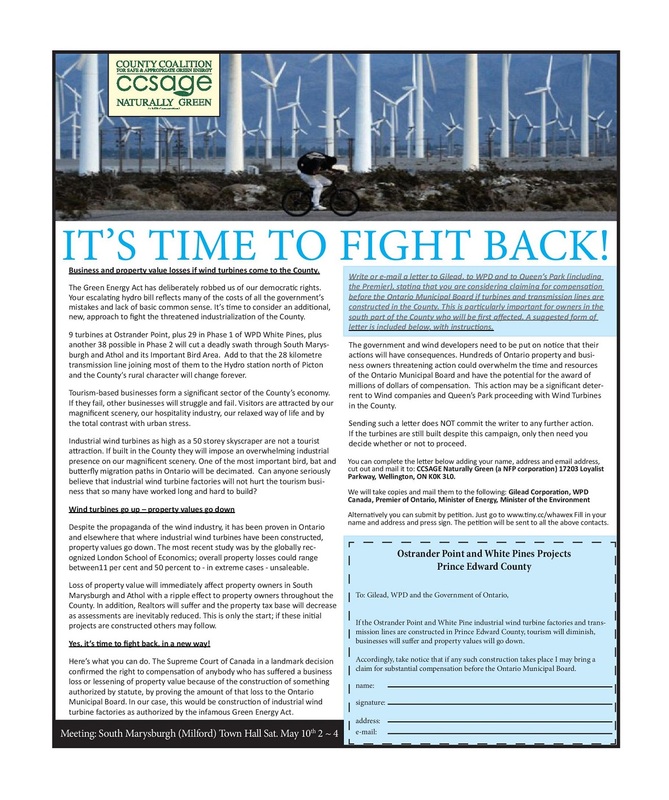 CCSAGE NATURALLY GREEN announces a brand new initiative in the fight against wind turbines in PEC. Our colleagues at PECFN and APPEC are to be congratulated on their efforts to date before the Environmental Review Tribunal and the Courts. We at CCSAGE Naturally Green have been researching a novel approach to fighting wind turbines and are now introducing it to County residents and businesses. It will put Queen’s Park, Gilead Power and wpd Canada on notice that their misguided efforts to industrialize the County with wind factories in south County and a transmission line along a 28-km route ending north of Picton, will have serious consequences for all of them. In 2013, the Supreme Court of Canada confirmed that if anybody suffers a business loss or reduction of property value because of construction authorized by statute (construction of wind factories is authorized by the infamous Green Energy Act), a claim for compensation, with proof of the loss, can be brought before the Ontario Municipal Board. Despite wind industry propaganda, wind factories have been proven to reduce property values and in the County are almost certain to damage tourism and the hospitality industry, among others. The material in the accompanying image (newspaper ad) provides more information. If you believe that your property or your business may be affected by construction of a wind factories in the County, you can put the developers on notice of a possible claim by adding your name to the petition HERE. Acting in this manner commits you to nothing further. Please take a moment to read the details and then act. Note: The Provincial election just called should not affect your decision to make your voice heard now, because the outcome cannot be predicted. Also, please come to the rally to support this initiative on Saturday, May 10, 2-4 pm at the Milford Town Hall.